BMIT has been confirmed as a National Champion in the 2014/15 edition of the EBAs - the European Business Awards. Our video presentation is online and viewers from all over Europe are invited to vote for their favourite business and make it National Public Champion. What are the EBAs? Since 2006, the European Business Awards have been given to companies that promote excellence, innovation & best practice in Europe. In this year’s edition, 709 businesses from 33 countries are competing for the prestigious Ruban d’Honneur, and the title of National Public Champion based on your voting choice. Cast your vote today! 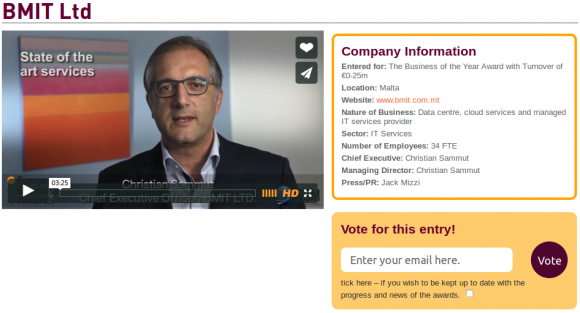 Watch BMIT’s video entry on the EBA and cast your vote today by typing your email address in the box and clicking on the ‘Vote’ button. You will then receive an email to confirm your vote. To complete your vote for BMIT click the link in the email. You can vote for BMIT multiple times using different email addresses. Voting closes at 17.00 on Tuesday, 24 February, 2014. Vote today.